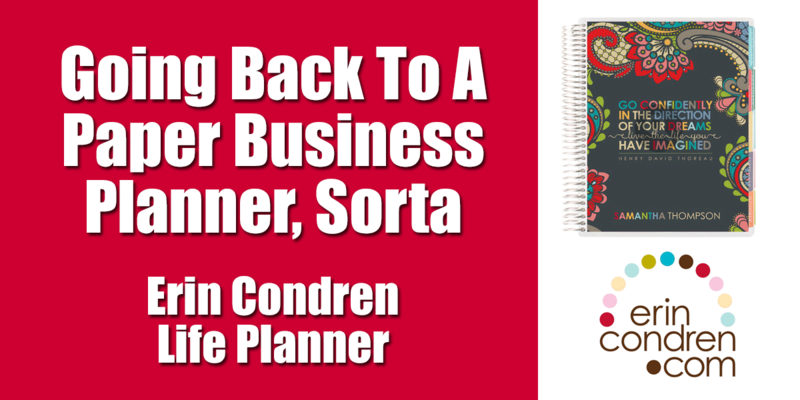 I am going back to a paper business planner…sorta!! I had to do it even though it doesn’t make any sense to my digital husband who can put everything into his computer and have it be an actual thing. For me the computer does work, up to a point. I can put in all my interviews and coaching clients so my assistant doesn’t double book me. I can put when I am traveling in, when the kids are off school and note when people are coming into town. I can add the fact that I had a mastermind meeting with my buddy Kir, but then what? How do I make a little smiley face to show that getting an email from someone I want to work with made my day? If I note that we are doing Christmas decorating for Family Fun Night, will I REALLY flip back through my digital calendar to see that in a couple of months or next year? I can tell you in all the time I have had my digital calendar (probably about two and half years now) I have NEVER gone back to see what happened when. It is too cold and sterile. Because I am so visual, I struggle a little bit with the computer. I did make it pretty colored to help break up the monotony, but still not glorious…sigh. With a paper journal I can add stickers and highlighters and color code things. I can make little notes to the side and remember when cool things happened. As you can see in the video, this is not so much a “what to do” calendar but more a “what I did”, “who I met with” and “great things that happened” record of what went on. The other thing that this accomplishes is that I can see the fruits of my labor. When I make a video I can note how many views it gets if it a runaway hit. I can see if this blog post strikes a note and do more like this or if a social media post gets a lot of likes. Yesterday a pretty big podcaster liked me on Instagram and Twitter. I totally want to make sure to share some of his stuff today…not a digital planner event, more a strategic nice thing to put in my planner and mark with orange! If you are an entrepreneur like I am, you probably understand why I have to schedule a personal life. Given a chance, I would be working everyday on my business, nose down and ignoring my family. Just this year this stopped working for me. Up until then I had been half of a DINK (Dual Income No Kids). My husband knew that I was going to work 60-80 hours a week and that made me happy and kept me out of his hair. Then we adopted 3 kids. They do not find watching me work fun (imagine that!) So now I have to make sure that I have more of a balance in my life and that I am rewarding them and myself by doing things together. With that in mind I got special stickers that I can use every time I do something fun with one or the other of them. It gives me an added incentive to put work down and play because they are really cute stickers! The link in this post is a “refer a friend” link…I will not receive monetary compensation but will get a $10 credit just like you!. All opinions are my own.